This little book from Joe Hashman is a gem. It's a diary of bits and pieces of gardening information, tips, observations, and recipes week by week during the year. Interestingly Joe Hashman starts his year in February, perhaps because January doesn't really do very much. It's even too cold to weed and tidy and even February he does a lot of "tidying". 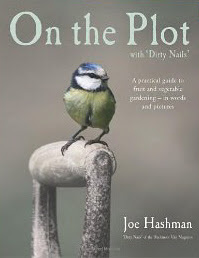 It's a good book to dip into and wonder if I should be digging the bed yet or what seeds to sow. Not a book to read from start to finish in one go.